Pura Tanah Lot is an icon of Bali tourism with the beauty of the sunset and the view amazing temple. One of the interesting attractions attention in Tanah Lot is a small cave inhabited by swarms of poisonous sea snakes, people refer to as the Tanah Lot Holy Snake. Holy Snake in Tanah Lot, Tabanan in Bali, Indonesia, famous for its variety of uniqueness with mythical stories. 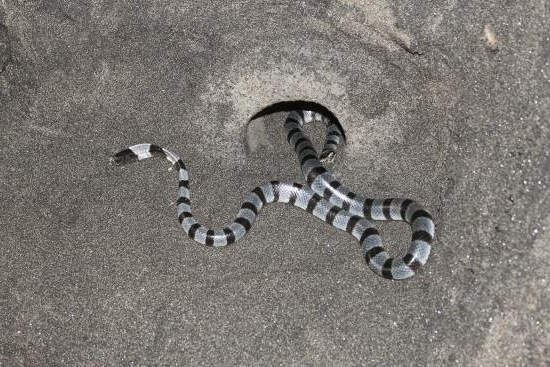 Land Lot Holy Snakes located and lived in a small cave located on the seafront. This cave can not be visited by the tourists if the tides. This cave will be submerged in water, sea water which will plug into the cave. Read also: Visiting Tanah Lot in Tabanan Bali. There are several caves that are around Pura Tanah Lot, Tabanan, Bali Indonesia, but only two caves are a tourist attraction during a visit there, the holy spring water cave with flavors of fresh water, and Holy Snake cave. The layout of Holy Snakes cave is near the cave Holy Spring of fresh water. 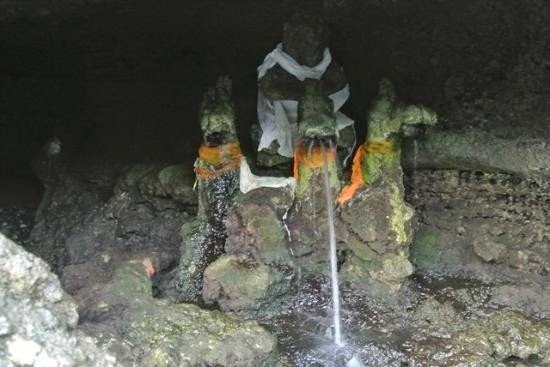 Holy Spring cave are brought Pura Tanah Lot. Two of these caves is an alternative attraction while in Tanah Lot. Tanah Lot temple courtyard inaccessible by tourists if not to pray. 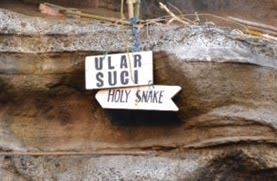 So that the tourists can enjoy the uniqueness of this region to see Holy Snake and Holy Spring. Read also: Tanah Lot, Bali's tourism mascot. Holy Snake cave dwelling has a width of about five meters. Inside the cave there is a statue with a height of about 50cm. This statue intangible an old man with a long beard. The statue it was Ida Rauh Dangyhang Nirartha, a Hindu priest who once imprisoned in the old at the time of the sacred journey in Bali in hundreds of years ago. Tanah Lot is one of the places that had become a haven by the Hindu priest. So that to this day, made a temple in honor of his service while in the place. There was a guard guarding the Holy Snake cave of Tanah Lot. The guards dressed in traditional Balinese dress. The guard had been an officer who approved or not for people who want to hold the Holy Snakes. If you want to hold the Holy Snakes in Tanah Lot, then you have to pay some money as fare. The moment when holding the Holy Snakes in Tanah Lot is very pleasant, most of the people who visit Tanah Lot will intend to hold the Holy Snakes. Holy snake in the temple of Tanah Lot is colored stripes, black and white like a zebra. Black and white called poleng by residents of Bali. So that the Holy Snake in named with Poleng Snake (lipi poleng). Some of the residents who call the snake as lipi sabuk, because the shape and color that resembles a belt. Sabuk means belt. In the Holy Spring cave resources are also guards guarding the water. Seen the Holy Water in Tanah Lot into a tourist attraction by tourists who visit. Tourists are welcome to wash face and hands with the holy spring. Travelers also can take the holy spring. Holy spring water is very amazing. Because water has such fresh river water. Whereas the water is located in the sea water has a salty taste. There is a myth that if we drink water from the Holy Spring while saying prayers, our prayers will be answered. In addition, many tourists believe that the water from the holy spring can cure various diseases, and if there are couples who do not have children, if the drinking water of the holy spring, then the wife will be given fertility and will soon have a baby . Legend or the origin of the Holy Snake in Tanah Lot Bali is very interesting. According to the surrounding of people in Bali, the Holy Snake cave in Tanah Lot is derived from a scarf belonging to Danghyang Nirartha, a Hindu priest of the most influential in the spread of Hinduism in Bali. That said, to protect the temple which he built a lot of land, with his power he changed her shawl into snakes are highly venomous. Even snakes were four times more poisonous than the cobra. Read also: Beauty of view at Tanah Lot, Tabanan Bali Indonesia.